Tyler Kandel has joined Sills Cummis & Gross in Newark as a member of its litigation department. 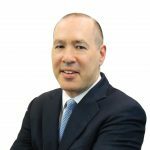 Kandel joins Sills Cummis from more than 20 years at Emmet, Marvin & Martin LLP in Morristown, where he started in 1997 as a junior associate. He focuses his practice on complex commercial litigation representing financial institutions, public and private corporations and commercial clients on issues including contract disputes, financial transactions, consumer and business banking, real estate transactions, fiduciary obligations, corporate and personal trusts, and more. He is admitted to practice in New Jersey and New York.